SUYATNO, Suyatno. PENGGUNAAN METODE PENEMUAN UNTUK MENINGKATKAN KETUNTASAN BELAJAR SISWA MATA PELAJARAN MATEMATIKA PADA KONSEP PENJUMLAHAN KELAS II SEMESTER I SDN DOYONG II MIRI KAB. SRAGEN TAHUN PELAJARAN 2015/2016. JURNAL PENDIDIKAN DASAR NUSANTARA, [S.l. ], v. 2, n. 1, july 2016. ISSN 2579-6461. 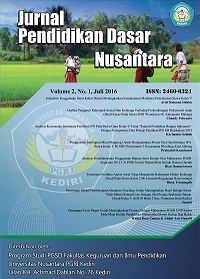 Available at: <http://ojs.unpkediri.ac.id/index.php/pgsd/article/view/363>. Date accessed: 25 apr. 2019.